Hey All, I'm heading up this Sunday for a week of fishing and looking for any tips. I'm staying near Westport and plan to fish that area and maybe south to Ticonderoga. I'm more familiar with the north end of the lake but I have fished this area before. A few years ago I found some smallies on rocky shorelines with steep drop-offs around the same time of year. Anyone fishing Ti lately? Looks like a cold front rolling in today and another on Saturday...has me worried but the later part of the week looks pretty good. Would appreciate any advice! Well, it ended up being a decent week overall. 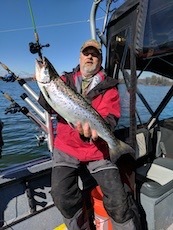 The bite was very tough at times but there were flurries of activity and I managed to catch quality fish every day. I was expecting to arrive to a post-cold front funk and that the fishing would improve as the week went on and the weather stabilized. It turned out almost exactly the opposite. I must have timed my arrival to get the pre-front action. The rest of the week seemed to settle into a typical summer pattern with brief windows of action in the mornings or evenings and sluggish, lazy fish the rest of the time. The wind was the calmest I’ve ever seen there. In seven days it never got strong even to the point where it made fishing difficult and there were several days where the lake was just plain flat. I was wishing for more breeze, but on the plus side the calm let me really focus on my vertical fishing. I fished out of Westport and ventured as far south as Champlain Bridge and north to Converse. The lake level was really low. I was lucky enough to find a spot late on the first evening that was loaded with smallies. They were hitting as fast as I could get my line in the water and still biting when I ran out of daylight. I didn’t want to hit the spot too hard but when fishing was tough over the next few days I would stop back there and catch a few to boost my confidence a bit. They were there most of the week but disappeared by the end. That was the only place where I found them grouped up. Otherwise I was just catching one or at most two fish at a spot. In general I found smallmouth in 19-24 feet of water in areas you’d expect – humps, rocky points, boulders, etc. I did most of my catching on drop shots but also had some luck with swimbaits the first few days. When the bite slowed down I had to fish vertical and pretty much drop it on their heads. Quality of fish was good, I had two smallies over 4 lb and a handful more 3+. All of the humps had weeds on top. They got thick at 8’ or less and sparse out to 14’. I tried fishing the tops of the humps and those weed edges with very little success. Maybe the bass were just all deeper, but I don’t know if I was fishing them right. I’d be curious what other folks find to be a good technique for fishing those deeper weeds while still covering water. I got several nice largemouth but couldn’t put together a consistent pattern. The pre-front day I found them flipping weedbeds in 3-8’ of water. After that I spent an awful lot of time trying weedbeds of all varieties without much to show for it. I got some on rocky points as well. In all of my previous trips to Champlain I caught two sheepshead. Last week I couldn’t keep them off my line! I had 3 or 4 in one day. I cruised over one shallow point and it was just covered with them, there had to be two dozen right below me. I don’t get too excited over them but they did break up the monotony a few times when the bass bite was non-existent. Also got a few nice pike and pickerel. I had a great time and enjoyed getting to explore this part of the lake. There were a ton of spots where I didn’t catch anything but they looked great and I’m sure would hold fish on another day or under different conditions. Thanks for the report, I like to see bass report as well. I fish only the northern part but would like to try south next year. Thanks for sharing your fishing time with us. Glad you were able to catch some fish every day.